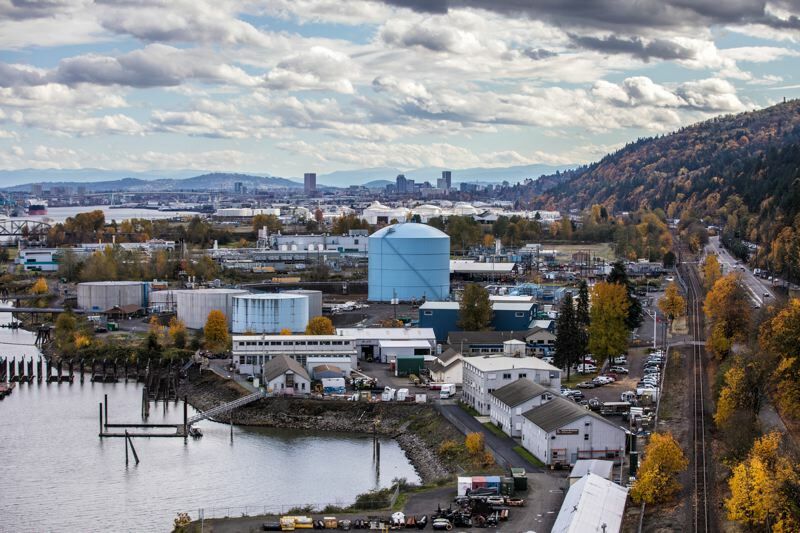 Linnton, a former mill town on the road to Sauvie Island, sits anxiously near several polluted properties, including a dense cluster of chemical storage tanks and the Portland Harbor Superfund site. Its 1,000 residents, now part of Portland, also live close to 121 industries that are permitted to discharge air pollution, according to a report issued this summer by the Linnton Neighborhood Association. Linnton's leaders worry about potential health and safety threats posed by these and other sites, and question whether help would be able to reach them during a disaster. "Our location, our relatively low population, and lack of accessibility in a major quake will likely leave us without support of first responders," says Nancy Hiser, a member of the neighborhood association's environmental committee. It's a viewpoint city officials don't dispute. "Linnton is one of the most vulnerable locations in the city because of the nearby critical energy infrastructure and its risk from earthquakes, landslides and floods," says Dan Douthit, spokesman for the Portland Bureau of Emergency Management. "Following a major quake, first responders will quickly be overwhelmed and will have difficulty reaching residents throughout the city, including Linnton." Many of Linnton's residents live on a hillside above a 6-mile-long terrace on the west bank of the Willamette River between the Fremont Bridge and Sauvie Island. State officials say the terrace is home to all of Oregon's major liquid-fuel port terminals, a liquefied natural gas storage facility, and fuel pipelines, which are vulnerable to a potentially catastrophic Cascadia Subduction Zone earthquake centered off the Oregon Coast. So on Aug. 5, when a fire at a North Portland scrap-metal recycling yard sent towering clouds of black smoke over their homes, many Linntonians feared for the worst even though they were separated from the danger by the quarter-mile width of the Willamette River. Shawn Looney, president of the Linnton Neighborhood Association, says residents had no idea whether the threat was distant or nearby, or what kinds of chemicals might have been in the smoke. It is not clear from a Portland fire bureau report whether toxic chemicals were released in the blaze, which ignited in a pile of scrapped cars. The yard, owned by Schnitzer Steel, was not among the 121 sites identified in the neighborhood's air pollution report because it does not have an air pollution permit. "The brief fire did not have any significant impact on air quality," says Colin Kelly, a Schnitzer Steel spokesman. If the fire had occurred in the tank farms, Looney says, "It would have been serious cause for concern, and evacuation would probably have been the safest thing to do. Living among the gasoline storage tanks is like living near a time bomb." Looney says the neighborhood narrowly averted disaster in 2015, when a truck carrying gasoline on Highway 30 in Linnton crashed into several parked train cars. "If those train cars had had oil, alcohol, gasoline, diesel or any number of other highly flammable contents, the outcome could have been horrific," he says. Linnton residents depend on the city's Reverse 911 system to alert them in emergencies, Looney says. The system, which the city calls PublicAlerts, automatically dials people who might be affected by fires and other disasters. But on that August night, the calls never came. Lt. Tommy Schroder of Portland Fire & Rescue says it activates the system only "if there is a risk to life." But Looney says there could have been harmful health effects from breathing the smoke, and a warning should have been triggered. Citizens in Linnton aren't sitting idly in the midst of their many safety and pollution concerns. In an effort to inform residents about air pollution threats in Linnton, in June the neighborhood association published an eight-page report showing industries with permits to emit air pollution in the area. And this fall, the neighborhood association will install two air-pollution monitors that will measure diesel particulates and other chemicals emitted by industry. The monitoring will be done cooperatively with other nearby neighborhood associations, including those in St. Johns, Overlook, Cathedral Park, University Park, Eliot and the Pearl District. "We want to become better educated about airborne diesel particulates and industrial toxins and improve air quality," Looney says.